Anyone who works in a production facility or distribution center knows how loud these places are. The sound of forklifts, the constant whirr of conveyors, the thrum of generators, and the steady beat of all things mechanized can be overwhelming. There are also specific, distracting noise producers, such as small engines, stampers, and generators. Over time, people adapt to this environment, “tuning out” noise as much as possible. Research from the National Institutes of Health is clear: sound affects productivity. It’s also unsafe on a number of levels for industrial workers. Noise impacts productivity when it’s loud enough, persistent enough, for long enough. Singular noises, such as a machine that runs very loudly for a few moments are annoying, but the bigger issue may lay in persistent background noise, the type of environmental sounds that slowly and surely affect everyone in a large industrial facility. What level of noise is legal? What level is acceptable? These are two different questions. Very loud noises can cause hearing loss, and at a certain level, falls into OSHA regulations. 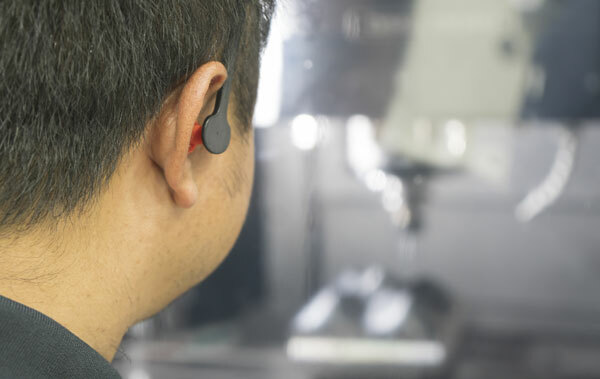 “Over the past 20 years, government agencies have consistently identified noise-induced hearing loss as one of the top concerns of workers,” according to the agency. OSHA regulations limit exposure to sound of 90 dBA for 8-hour shifts. Despite this limit, you should aim for a much lower threshold. 50 to 60 dBA is considered comfortable and is the range where people’s productivity and personal safety is least impacted. Aside from hearing loss, excessive noise can result in issues ranging from tinnitus to stress to anxiety and even high blood pressure. (Source: OSHA). Some other federal agencies encourage even lower levels of ambient noise. Warehouse decibel ranges typically run from 78-84 decibels, depending on the type of forklifts, machinery and other factors (Source). This is still on the high end compared to office workers and other, quieter environments. Certain workers who operate machinery or drive forklifts are certain to be at higher risks in a warehouse. Workers who operate heavy machinery should use hearing protection, but this doesn’t help with site-wide, ambient noise. Workers in high levels of ambient noise may not hear things like approaching forklifts, which can cause collisions or forklift/pedestrian accidents. It’s impractical for many operations to erect permanent walls, but there are ways to reduce sound pollution. Earplugs and other necessary protection should be easily available to all workers and visitors. However, there are other methods for reducing the sound that either target larger parts of the facility, or strive to reduce ambient background noise. When you can contain the sound of an offending piece of machinery or process, you should. There isn’t any reason for an overly loud machine’s sound to bleed into areas where it’s not being utilized. This contributes to productivity and safety issues throughout the facility. Acoustic curtains blunt the kinds of annoying, high-frequency industrial noise by as much as 45 decibels. Use them to target specific, noisy areas or machinery. Frequently, they’re used to surround grinders, generators, and other noisy machinery. These systems come in single panels suspended on a track. They roll in and out of the way. They can isolate a particular machine by surrounding it, using multiple curtains. For longer areas, connect a longer series of curtains. They could separate a production area, with noisy machinery from a warehousing area, for instance. They slid in/out of the way and connect with Velcro for easy accessibility. Standard sizes are 8′, 10′ and 12′ high, with widths ranging from 5′ to 14′, and customization is available. Sound control screens are another option and are ideal for segmenting off a particular piece of equipment. They are frequently placed around vertical and horizontal generators but work for any noisy machinery that can fit inside them. They don’t require ceiling mounted installation — just sit them in place around the offending machinery. They can be ordered with casters for easy mobility, which may be useful for projects and construction applications. You can get them in 2, 3, and 4 sided configurations. If our goal is to reach “comfort zone” of less than 60dbA, a large conveyor-driven distribution center presents issues. Typical lineshaft conveyors can reach 70dba. If each section has a motor, gearbox pulleys and other potential noise-producing components, reducing the issues associated with them should be a priority. Make certain your employees report any unusual noise, which can be a sign of other issues. Deploy automation that cuts off roller activity when a conveyor zone isn’t actively being utilized. Be proactive with system maintenance. This helps prevent noisy bearings, motors, and pulleys. As a bonus, proactive maintenance will also reduce downtime and increase system efficiency. Specify quieter, gearless conveyors like 24-volt e24 conveyors, which significantly reduce noise across an entire building vs. a conventional conveyor system. e24 is ideal for operating only the rollers needed at the moment without interrupting conveyor flow, and its drives are inherently quieter than conventional lineshaft motors. American Greetings did just that with the goal of reducing noise throughout the facility. You can also reduce the use of fans, which are inherently noisy. One alternative is to replace directional fans with quieter options, such as HVLS fans, which help keep the floor more comfortable and produce little discernible noise. Finding ways to muffle, reduce, and contain noise in your facility is an important step toward creating a functional, productive work environment. In this era of tight labor supply, every possible advantage may help you retain skilled workers and produce faster, better, and more efficiently.